This is the fourth blog in a series covering the role of housing in the economies of developing countries, with a focus on South Africa. CAHF has developed a Housing Economic Model to quantify the economic impact of residential construction and rental in South Africa. This model takes national statistics for the Construction sector (SIC5) and Finance, Insurance, Real Estate & Business Services sector (SIC8), as well as data for intermediate inputs into these sectors, and analyses the economic impacts of residential construction and rental. This process requires certain calculations and assumptions, as housing construction and rental are not separately identified economic subsectors in South Africa’s national accounts. In this blog, we analyse the economic impacts of housing construction and rental in more detail, as an addition to the overall economic impacts discussed in the previous blog. Residential construction and rental together have significant impacts on the secondary (manufacturing) and tertiary (services) sectors of South Africa’s economy. This substantially impacts four Standard Industrial Classification (SIC) sectors significantly: SIC3: Manufacturing, and SIC5: Construction in the Secondary sector; and SIC8: Finance, Insurance, Real Estate and Business Services, and SIC9: Community, Social and Personal Services in the Tertiary sector. The total intermediate inputs of R71.6 billion (US$5.5 billion) stimulated by residential construction and rental South Africa in 2014 impact mostly the four SIC sectors mentioned above but have lesser impacts on the other five. These are shown in the Figure below. The construction and rental sectors have different economic impacts: residential construction contributes more to manufacturing, while residential rental stimulates services more generally. However, they are both ‘Proudly South African’ sectors, with 85 percent of construction inputs and 91 percent of rental intermediate inputs being locally sourced and manufactured. While the economic contribution of residential construction is intuitive, the economic contribution of rental housing is surprising. It generates significant economic activity, has a higher skills profile, and is less affected by economic cycles. In addition, households across the income profile rent accommodation, and even in the informal economy, household landlords generate income in this way from their existing household assets. 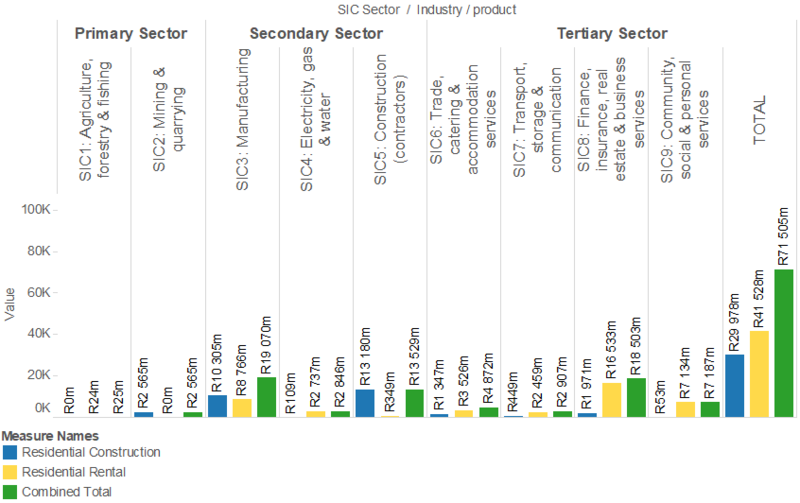 We can see that SIC2 (Mining & Quarrying), SIC3 (Manufacturing), and SIC5 (Construction), feature more significantly in the housing construction and maintenance sector; while SIC4 (Electricity, gas & water), SIC6 (Trade, catering & accommodation services), SIC7 (Transport, storage & communication), SIC8 (Finance, insurance, real estate and business services), and SIC9 (community, social and personal services) feature more significantly in the rental sector. This shows the more manufacturing nature of house construction, and the more service-focused nature of housing rental activities. This stands to reason: housing construction produces a certain number of houses or house extensions each year – the building process has a set number of new houses or usable spaces it adds to the fixed capital of the country. The rental sector on the other hand, includes all rentals from all rented accommodation each year – rental units carry on realising economic value as the rental service is delivered over time. Overall, although South Africa’s rental sector is relatively small as a proportion of housing overall, it contributed 38 percent more value in intermediate inputs to the economy in 2014 than the residential construction sector. In fact, rental contributes 75 percent more domestic production value than residential construction. Residential construction and rental are also important employment generators and sustainers. At 2014 levels of production and activity, residential construction and rental together sustained a full-time equivalent workforce of 468 000 people. Residential construction accounted for 242 000 employment opportunities, while rental accounted for 226 000 employment opportunities in that year. While the residential construction workforce is less skilled (11 percent are highly skilled and skilled, 31 percent semi-skilled and 58 percent informally employed), residential rental draws on a much more highly skilled workforce (71 percent highly skilled and skilled, 13 percent semi-skilled and 16 percent informally employed). Critically, should South Africa be able to improve the match between supply and demand, there is potential to improve labour utilisation rates, and to create new employment opportunities. However, as with all construction activity, the consistency of the economic throughput determines how many of these employment opportunities that are created are sustained in the economy over time. This is not the end of the impact that residential construction and rental have on the economy. There are further economic ripple effects (indirect and induced economic impacts) that are generated by the direct economic impact of housing. Of course, the economic impact of housing is also felt ‘down-stream’. Housing helps to stimulate demand for furniture, appliances, garden equipment, security and other home-related services such as insurance and financial products. However, we do not quantify these impacts in this analysis. This analysis also doesn’t unpack the detail of the role that housing finance plays in the wider economy and the important function it plays in moving money through the economy. However, the significant impact of housing construction and rental on SIC8: Finance, Real Estate, Insurance and Business Services is evident above. And from much of CAHF’s other work, the ability of housing finance to convert housing demand into real housing supply is clear. Where demand can be realised, construction and rental activity follows. Lastly, we are also not including the full impact of the informal sector in these figures. While a provision is made in national statistics for informal sector contributions, these figures are underestimating the role of the informal economy in both the residential construction and rental value chains. Initial calculations indicate that in South Africa’s economy, this is significant. An estimated two thirds of new households formed annually in South Africa are housed informally. This growth in informal housing is estimated by CAHF to contribute around 14 percent (R8 billion) of annual residential construction value to South Africa’s construction economy, but more work is required to calculate this more accurately. CAHF estimates that informal accommodation rental alone is a R10.1 billion per annum industry. It is estimated that 11 percent of all rental income across all housing sectors is from informal accommodation, of which backyard rooms and shacks account for an estimated R8.5 billion of the total informal rental receipts. This is truly a “Massive Small” housing economy, worthy of recognition and further analysis. The four Housing and the Economy blogs so far have provided an overview of how housing value chains assist us to understand the relationships between housing and other sectors of the economy. We have illustrated these concepts using data modelled for South Africa in 2014. The next series of blogs will focus on new work CAHF has completed that looks at the housing economic value chains for South Africa in 2017, South Africa’s subsidised housing economic value chain as well as calculations of the economic impact of housing in Kenya, Nigeria and Rwanda. In many national accounts, a value is also attributed to owned housing. This imputed value of that house to the owner is not included in our calculations.